Jamal Khashoggi was assassinated to silence his voice as a prominent critic of Saudi Arabia. 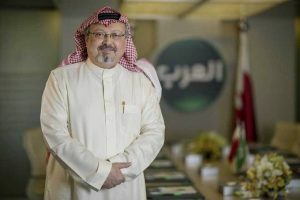 Moving to the U.S. in June 2017, after being banned by the Saudis for criticizing President Trump, Khashoggi was eventually hired by the Washington Post in September of the same year. As a journalist in the U.S., Khashoggi became a Virginia resident and a prominent commentator on the Saudi monarchy and their disastrous war in Yemen, which has left over eight million at risk of famine. Two weeks ago the Virginia-based journalist was lured into the Saudi Arabian diplomatic consulate in Istanbul, Turkey. He was never seen again. According to Turkish intelligence reports, he was dispatched via Saudi operatives, dismembered, and then disavowed. Only after intense public outcry from the international community and media have the Saudis hinted that it was a possible “interrogation gone wrong.” Even by today’s frayed international norms, assassinating a journalist at a diplomatic consulate is dark — so very dark. While the Saudis continue to obfuscate and misdirect (in the face of U.S. silence), the Turkish government has investigated, and released intelligence reporting that shows Khashoggi was detained within minutes of entering the consulate. Officials have then said the journalist was tortured, and that his fingers and head were eventually severed from his body. The New York Times has also reported that the Saudi operatives included a “doctor of forensics,” who helped with Khashoggi’s dismemberment. For anyone who has ever been involved in Middle East politics, this move by Saudi Arabia should come as no real surprise. They are a fascist country run by a religious monarchy. What is surprising is that the Saudis, for the first time, are truly experiencing international isolation, pressure, and condemnation. Which is also novel, since the scourge of Sunni-based international terrorism, including al-Qaeda, the Islamic State, and the Taliban, can be linked back to their involvement, funding, and religious ideology. Remember that time 15 of the 19 September 11th hijackers were Saudi? You should. Yet when you are the world’s leading global exporter of oil, buy copious amounts of weapons from the U.S. for use in a disastrous civil war in Yemen, and pretend to be the bulwark against Iranian regional aggression, then all things can apparently be forgiven. Except this — maybe. Global executives and CEOs have also pulled out of an economic confederate scheduled for Saudi Arabia next week. The Saudi attempt to rebrand their country’s image as a moderate desert kingdom, away from the despotic oil state it actually is, has now become impossible — not that Saudi Arabia had any real desire to ever become such a country; they just wanted the international community to think they were. Instead of speaking against Saudi Arabia, the president is putting U.S. arms deals with the Saudis’ (around $4bn in 2017) ahead of human rights, press freedoms, and the protections afforded by a citizen’s diplomatic consulate. Yet the president’s concern with defense contracts and U.S. economy is little more than smoke and mirrors. In truth, Trump doesn’t care. His antipathy towards the press is well known; his comment that Khashoggi might have been murdered by “rogue killers” supports this. And more than once on the campaign trail, he boasted about how many personal business deals he has with the Saudis. The Washington Post also found that Crown Prince Salman’s personal delegation boosted rental revenues at Trump’s New York hotel by 13 percent – the same Salman who’s denials Trump is taking at face value. Unfortunately for the international community, Secretary of State Mike Pompeo, who met with Trump today and traveled to Saudi Arabia to address the growing crisis, is fully bound by whatever reaction Trump thinks is appropriate in the moment. The Washington Post reported yesterday that the U.S. and Saudi Arabia are now looking to “[seek] a mutually agreeable explanation for journalist Jamal Khashoggi’s death.” All of which amounts to diplomatic and political doublespeak, allowing the Saudis’ to save face, divest responsibility, and return to business as usual. For those of us concerned with anti-fascism, corruption, and how they connect to the creep of authoritarianism at a global level, Khashoggi’s words could not have proven more prescient. The U.S. (for the time being) still remains the indispensable nation that all other nations follow, warts and all. When we undermine our own fundamental values — diplomacy, press freedoms, and human rights — and exchange them in favor of a fascist religious monarchy, liberalism loses and authoritarianism wins, abroad and at home. Khashoggi might find it ironic that his assassination has led to the kinds of condemnation and outrage he didn’t think was possible — but only just. Early this morning, Pompeo recommended that the U.S. give Saudi a few more days to “investigate” and “let the process play out.” By then, though, there won’t be any more blood to paint over inside the consulate. So very dark, pitch black.